Uh, I mean, hey, we’re making a management sim! Which… we’ve done almost none of so far, BUT we’ve been setting the pieces in place for proper implementation. “Supplying and setting up” the feature, if you will. Setting aside that – at the time – the characters’ heuristics weren’t even implemented yet, we also had to build a system where the military could actually consume things as a requirement in the first place. The prototype of that which we implemented within the last few months was the concept of ammunition, which was our symbolic link to the “determined by supply” portion of our design with combat. I say symbolic because it fulfilled the technical requirement there, but didn’t actually fulfill the spirit of the idea, because as a player you’re currently fighting fishpeople and bandits who don’t have the restrictions of ammunition largely impacting their performance. Instead we set up the players with a circumstance where they would be an even-fight-at-best against the bandits even if they had ammo, and without it they were very likely doomed to just lose resources forever. There’s a balance issue here, there’s a “counting bullets” issue, and there’s the issue of getting back on track with our intentions. The balance issue is that players who are doing everything right should win, and players who aren’t should have a harder time. Doing things right in this context means building infrastructure to maintain ammunition, which lets you delve into the (albeit relatively short) supply chain needed to get the bullets out. That motivation is awesome, but the payout seems bleak: do it right and you might have a chance. Do it wrong and you’re screwed. Balance issues almost always come up after a new feature though, and this has only been in for a few weeks, so this just needs some numerical adjustments. The “counting bullets” issue is that our current setup also conflicts with our design statement, in that combat should have “its outcome determined by supply and setup instead of tactical micromanagement”. Counting bullets is micromanagement, and we don’t have historically accurate guns because this isn’t Earth. Bullets per mag and mags per gun and how they reload and jamming chances are all potentially really interesting mechanics (see Receiver), but we’re focusing on managing people, not guns, so for us this is overly fiddly. So basically need a way for players using a supply chain effectively to have combat units that will (generally) win, and to use a much coarser measure of combat supplies than “literally the number of bullets in a unit’s inventory”. So let’s create the most basic, abstract idea that we can, and go from there. Let’s make a box that we can construct with a workshop that will just make combat units better (typically) than their opponents, and they’ll use them up as they fight. Let’s call them Supplies, and let’s make them out of symbolic things that a military squad might need: bullets, cloth, and food, to tie together a bunch of the supply chains in the game. 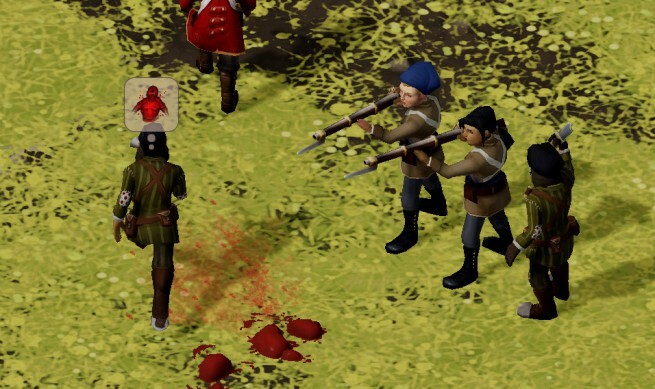 Using a unit of supply should make a squad better for a period of time, at which point they’ll need more supplies. Now we can actually serve one of our other goals really simply too. 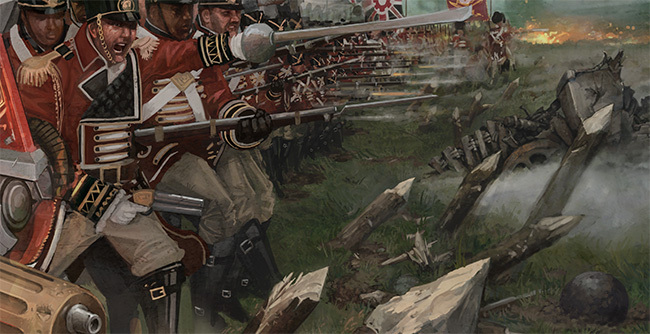 Going back to the “Combat should be slow, mostly positional” part of our statement, we’ll be automatically serving the positional aim by having to keep supplies in strategic locations, but we can slow things down too. Generalizing quite a bit, we have two reliable and quantifiable knobs we can turn on combat. We can tweak offensive power or we can tweak defensive power. (Changing things like tactics and behavior are great, but we really want something quantifiable in this case.) If we increase offensive power, we speed up combat, and if we increase defensive power, we slow it down. So let’s say that supplies increase the defensive capacities of the characters, because right now combat is too quick for our liking. Now we’ve got a system! We’re tackling all of the points of our mission statement and we can start building out complexity as we feel its warranted. This system also gives us a great opportunity to implement our, uh, trickle down economics? 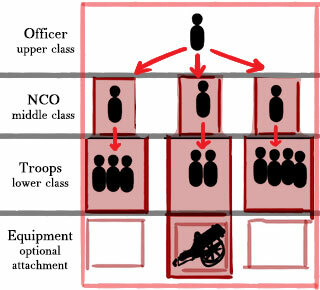 [INSERT IMAGE OF NCO INHERITANCE FROM COMBAT POST OR MARGARET THATCHER]* Because we want to keep emphasis on the leaders of the squads, so they’ll have the supply and the lower class military can just ask them what’s going on. Some of this is implemented in our internal build but is not yet finished. As soon as it is, we’ll get it in your hands to test out. New Item Idea: Chekov’s Gun. Upon construction, character immediately places item in drawer. It is never seen again. Actually, the gun makes an appearance. The game FORCES every last-stand to take place there, with the enemy’s ‘leader’ unit attacking the lone survivor. Reaching into the drawer, the survivor finds the gun and shoots the big baddy, becoming the hero of the colony. However, he also becomes a pompous jackass nobody wants to be around… not even the aristocrats. The supplies idea you’ve got going on here sounds like it could work pretty well. I assume that having better supplies in the boxes will give better results as-well, i.e. Potato sackcloth vs. fine cotton vs. Victorian era steampunk Kevlar and raw cabbage vs. tinned fishperson vs. roast turkey/dodo and cake. Also the same concept of supplies could, perhaps, be applied to enemy groups. The first group of bandits in a given game could be poorly supplied, surviving off what they run off with from your colony, and therefor comparatively easy to kill off. Later on in the ‘mid game’ a similarly sized group could be better supplied and harder to kill representing a fairly successful organization, and so forth. There could also be bandit groups that are clearly better supplied than ‘normal’ highwaymen should be and therefor an investigation into who/what is backing them could be an interesting ‘quest’. I guess C does kind of lend itself to shooting yourself in the face. When I was made to use it for University it seemed logical, but gave me the feeling of walking into a machine shop and noticing a distinct absence of safety covers and kill switches — everything in C seems to work perfectly well and efficiently, but pray to whatever power you believe in that you do NOT screw up, because nothing is going to protect you from your own mistakes. Or the mistakes of others. Where modern languages try to anticipate what the programmer is and isn’t likely to want to do today (and make it easy to do likely things and hard to do inadvisable things, like stomping on the memory), C just says “I’m sure you know what you’re doing.” and helpfully brings you more ammunition when you start shooting yourself in the foot. With the stories I’ve heard of things going wrong with C, the ultimate C-inspired weapon would be a lightweight, powerful, autoloading artillery weapon that, instead of being AIMED like a traditional howitzer, takes a selection of numbers on Standard Issue Imperial Punch-card. The first is a number of shells. The remaining numbers are the type, coordinates for the shell to land, and, if applicable to the shell type, fuze settings for each shell in sequence. Different shells need different numbers of arguments, but Imperial Artillery Officers are expected to remember them. There are no sentinels to separate different kinds of data and any punch pattern is valid in any field. The gun will fire all the indicated positions before responding to further input, but it does so very quickly and efficiently. You don’t want to get the number of options for a shell wrong, that will cause an offset and lead to an unpredictable sequence of firings of assorted ammunition in seemingly random directions (shell types interpreted as coordinates, etc.) with potentially unsafe settings (airburst timers set only moments from firing, or to minutes of time (Why does the Standard Colonial Export Air-Defence Shell MK.VII even HAVE that setting!? ), etc. ), potentially wasting Imperial war materiel, and posing a hazard to the gun, the emplacement, nearby friendly forces, and local wildlife out to a surprising radius. You don’t want to mispunch the number of shells, either, because the cannon will read the serial number, page number, factory code, quality control inspector tag, etc. which have helpfully been encoded at the bottom of every Standard Issue Imperial Punch-card as firing orders; again resulting in possible accidental shelling of… pretty much everything. …now I want to draw this Deluxe Programmable High-Efficiency All-in-one Bombardment Apparatus for Colonial Defence. Actually, if there’s one thing I learned from Zachtronics’s old free games, it’s that playing around with programming/otherwise hacking on unlikely contraptions in visually novel ways is a whole lot of fun. Somebody could make a game in itself out of modifying and interacting with various quirky systems which function/malfunction in various clever, unusual ways. I’d certainly play it. The old joke about C is that it combines the power of assembly with the user-friendliness of assembly. The unhappiness penalty to reassignment is a solid enough idea, but if I may be so bold; What about a small/marginal boost to “squad efficiency” (in whatever context within your system) for keep men together in a squad? A brothers in arms bonus, if you will. A small boost along side that unhappiness penalty might be an idea. Not sure if it’s a GOOD idea, but just one I thought I’d through out there. It strikes me that supply usage and effects are a good place for the individual quirks of leadership of NCOs and Officers. Like, some leaders are Logistical Geniuses, and their supplies are used up slower, or contrariwise they’re Skimming The Books and the soldiers at the bottom get proportionately less effect from being supplied. That sort of thing. Finally! I became a happy owner of your super-awesome addictive game. Keep it Up Guys ! Can’t wait for more updates !!! This is not warhammer, boy. There will definitely be more, uh, other things. We’re not going to do the traditional stuff though, but if we do we’ll be doing it in an unusual way. But don’t worry, there will definitely be more content for non-human characters and, um, destructive implements. In 33 c seems well calibrated confrontation between ficepeolple and bandits, I’ve always had crashes but I don’t know tell you the technical specifications, even the food looks stamped, sometimes goes in spurts but then it unlocks.